The mission of the Kids’ Pasta Project (KPP) is for youth to serve their local community by preparing and selling freshly-made, healthy meals and giving profits to local causes. Where possible, the ingredients for the meals are from local producers and businesses. The Kids’ Pasta Project provides the opportunity to learn the value of service to community as well as relevant life skills. A key intention of the Kids’ Pasta Project organization is for it to be sustainable, adaptable and transferable to any community. We are now scheduling dinners for all of 2019! Organizations can contact Pam Bliss. $14 adults / $8 kids – salad, bread, full lasagna or pasta dinner, dessert. We will be serving Lasagne (GF Eggplant Lasagne or Lasagne made with freshly rolled pasta & home- made sauces), bread, green salad and fruit crisp. The Kids’ Pasta Project began as an idea for empowering youth through fundraising dinners and quickly grew to address a broader opportunity for philanthropy education. It has proven to be a way for kids as well as other community members to serve and learn more about our community. 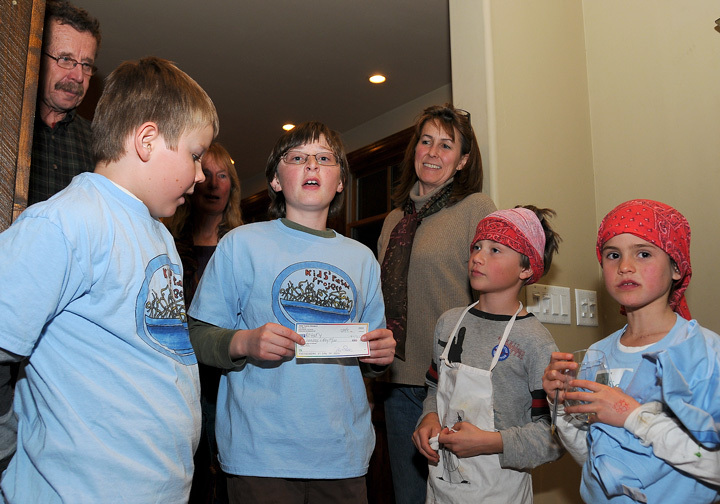 The Kids’ Pasta Project began serving pasta dinners to raise money for the North Fork Valley community in the North Fork Valley in March 2009. The North Fork Community includes the towns of Paonia, Hotchkiss and Crawford in Delta County, Colorado, an area known for its small farms and vineyards and pioneering spirit. The idea of the Kids’ Pasta Project was seeded as kids churned out home made pasta in the kitchen and played restaurant. Thinking about sustainable ways to raise money led to involving kids in fundraising and and making it a positive educational experience. Local chef extraordinaire, Eleni, generously offered her restaurant on Mondays during the school year to create this project, and the link between kids, pasta and sustainable fundraising quickly sprouted. The original idea of the KPP had to do with raising money for our schools, but as kids got involved in the spirit of service, it became clear that this would not be a project exclusive to one school or one cause. The “school” is all the kids who want to participate and the cause is community. Since Eleni’s restaurant was open on Mondays in the summer months, we moved to beautiful Scenic Mesa Ranch to serve our dinners, thanks to the generosity of its owners. KPP also enjoyed serving a dinners at Fresh and Wyld Farmhouse Inn in June of 2009. PJ’s of Hotchkiss offered to hold KPP dinners in downtown Hotchkiss until it started opening to serve Italian dinners on Monday nights. The Blue Sage Center for the Arts, The Paonia Teen Center and Delicious Orchards have become KPP dinner venues since that time. ● Community organizations benefit from celebratory fundraising dinners. We have served 170 dinners for community organizations since we began in 2009. ● Dinner guests benefit by enjoying a delicious dinner and learning more about the community organizations. The average number of guests is 40 per dinner. ● Local producers and businesses benefit. Whether we buy food supplies, get them at wholesale prices or have them donated, we highlight local food and let the dinner guests know where the food comes from. parents also enjoy the time working with their kids and other families. ● Others in the community also benefit from the opportunity to volunteer. While most of our volunteers are kids and their parents, we have had farm interns, business owners, grandparents and others participate simply because they enjoy the dinners and want to help. Our mission is for the youth to serve their local community by preparing & selling freshly made healthy meals with the profit going to local causes.